Bryant Park is an enchanting public space, made more so by the personalities and partners who come together to make the park function. Below, enjoy an article from Crain's New York, published earlier in the year, about Frank Raffaele, the dynamic personality behind our COFFEED kiosk on the 40th Street side of the park. COFFEED serves up delicious food, and meaningful social change, with a smile. Frank Raffaele's Coffeed donates a share of its sales to local nonprofits. Who gets credit for his success? Landlords. Frank Raffaele has donated more than $200,000 to local charities through his philanthropic artisanal coffee company, Coffeed, and he wants to give more. 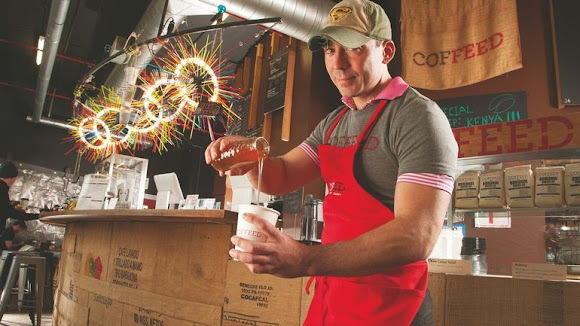 Raffaele is looking to raise $6 million to $10 million from outside investors for the Long Island City-based coffee-shop concept he founded in 2012 and hopes to one day make into a billion-dollar company. So far, he has grown the it organically, to a dozen locations in the New York area, from Bryant Park and Korea Town to Port Washington, L.I., and a branch in Seoul, South Korea. Raffaele estimates that revenue grew 300%, to $5 million, in 2015 from a year earlier. He plans to launch a loyalty program in which customers can preselect a ¬nonprofit to donate to each time they purchase a cup of joe. Raffaele hopes to make Coffeed a billion-dollar company. Raffaele credits much of Coffeed’s success to landlords who are willing to accept variable rents below market rate largely because of the company’s mission. In some cases, building owners have cut rents or selected a charity to get a cut of sales instead of a fixed monthly rent. “Landlords get the model,” he said. But the real key is offering customers good food and coffee. Everything that Coffeed serves is locally sourced and prepared from its own commissary. Greens, herbs and even honey come from Brooklyn Grange, the rooftop farm on the old Standard Motor Products Building in Long Island City. Coffeed staff also roasts its own beans. “Even if you give to charity, if the food and ¬beverage is horrible [customers] won’t come on a day-to-day basis,” Raffaele said. A version of this article appears in the January 4, 2016, print issue of Crain's New York Business as "Coffee firm well grounded in philanthropy".